This page provides you with Senior Product Manager resume samples that you can use for inspiration in writing your own resume, or for creating one through our easy-to-use resume builder. Below you'll find our how-to section that will guide you through each section of a Senior product manager resume. Are your probably absorbed in so many responsibilities at your current job that you find it hard to create time for a good resume? Is this delaying you from taking that position? Are you certain that is the next step for you? If yes is your answer to all of these questions, then look no further, you have reached your destination: in fact, have the best Senior Product Manager resume sample on the web! We are experts in helping others create great resumes to further their career. Being the senior product manager is a very big step ahead. We believe you have the skills required to fill the job position properly but you don’t just know what to fill into the resume. You have the managerial acumen and knowledge to run the position effectively but find it difficult to put together that resume. We are here to help with all of that. What we basically do is guide you. You hold all the answers to writing a good resume and all we plan to do is to help you achieve that level of professionalism. We are confident that with our help, things can get better with your resume. 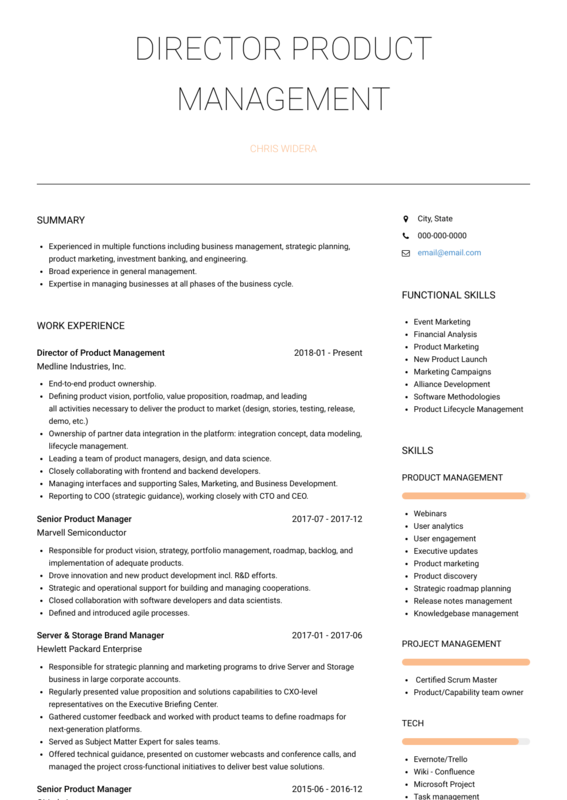 How to Write a Senior Product Manager Resume? This is the very first step to take. You have to know how to write and structure your resume to contain all the details which your employer needs to know about you. They layout which you would be using has to one such that there is absolute clarity and the employer is able to easily go through your resume. Don’t overcomplicate things. Simple is quite good enough. Pick a simple font with a colour and size that fits seamlessly into the layout. Pick something that doesn’t make your resume look like an art project. The clearer and monochrome fonts are always more attractive to recruiters. There is no need to underemphasize headers and spacing. They determine a lot in the resume. They determine how good it turns out to be and how neatly organized it is. Make use of clearly defined headers and space your resume out properly. It is only by doing this that you get to simplify everything for your recruiter. The recruiter doesn’t have to spend precious minutes looking for different sections of your resume as it is all clearly available to him or her. You can also consider saving your resume as a PDF. State clearly the reasons for leaving your last position. List your most recent working experience. In becoming a senior product manager, the previous work experience which you have had would set you apart. However, you have to make sure that you state the most relevant skills in your resume. Also make sure that only the most recent work experiences come first. You may even decide to ignore work experience of more than 20 years ago. This section will educate the recruiter on the duties and responsibilities that make you important to their firm. Don’t embellish. Not even a little! Need more tips on writing an efficient work experience section for a Senior Product Manager? Check out our detailed resume guide. Now, it is time to take things further with your resume. A very detailed but brief section on your education does all parties some good. As a senior product manager, your education can be said to be equivalent to your competence. You cannot ignore the importance of your formal training and all the training which you received by being a part of professional exams or other relevant courses. Your formal education, i.e your school training forms the basic elements of education while other form a part of extra qualifications and certifications. When your studies started and ended. What schools you enrolled and completed your education at. The name of the course and any degrees or qualifications received as a result. Nobody has the same educational background and if you have any extra training asides the basic elements listed above, it would do you a lot of good to list them. It may end up scoring you some extra points. The skills in your resume will surely set you apart. The skills determine how qualified you are for the position or not. Don’t just think the position can be handled haphazardly. There are certain skills peculiar to a senior product manager. Such skills are considered to be of vital importance when writing your resume. Never omit them. Cover letters are a personal choice but most people find them useful. Follow our tips here. Here are a few extra pointers to help you out if unsure. Watch how you word certain things. Read your resume twice before sending. Double check for typos or errors. Think you’ll get anywhere by lying. Use references you know can’t be reached. Opt for a joking tone. Thanks so much for your time: you now have access to standout senior product manager resume sample: if you are also looking for the best product manager resume templates, you should check this masterpiece we have been working on here : many professionals like you have successfully used it to take their career to the next level.